This project continued the assessment of pre-Reformation ecclesiastical sites within north-west Wales. It complimented the three completed projects that examined different aspects of ecclesiastical sites within the area, namely the assessments of medieval parish churches, of Early Medieval burial sites, and of Early Medieval ecclesiastical sites. The sites examined within this project were made up of deserted church and chapel sites that had been excluded from the initial church project because they were no longer in the possession of the Church in Wales, and from the Early Medieval projects because they had no obvious claim to a date preceding AD 1200. The initial data was obtained from the regional Sites and Monuments Record, which was searched using the keywords ‘church’ and ‘chapel’ to identify all possible sites, and then processed to remove those already assessed within the initial church project, and post-medieval non-conformist chapels. This produced a total of 121 sites, from which a further 15 non-relevant sites were removed, leaving 106 sites. Subsequent research, see below, identified a further 8 sites, resulting in a total of 114 considered as part of this report. Many sites within the list were known by tradition only, or perhaps by name only, and their location and status was not readily identifiable. It was therefore considered of importance to identify those sites for which there were good primary references confirming their existence. The starting point for this was the Valor Ecclesiasticus (Caley and Hunter 1810-34), the description and valuation of church property undertaken at the time of the Reformation (1535-6) by local commissioners and the clergy (in north Wales one of the leading figures was Richard Bulkeley). Though earlier lists of churches exist (in particular the Valuation of Norwich taken in 1254 and the Taxatio of Pope Nicholas taken in 1291) these, and particularly the latter, only included churches above a specific value, and dependant chapels were usually excluded. Also of use was Leland’s Itinerary, undertaken in 1536-9, which provides a comprehensive list of churches and dependant chapels (the version edited by Smith, 1906, was used for this project). Leland’s list is most complete for Anglesey (printed in Appendix B in Smith 1906, and probably compiled for Leland by a Rowland Griffith prior to the official valuation printed in the Valor; the material in the appendix is taken from Leland’s Collectanea, see Smith 1906, 128). In the Peniarth Manuscripts is a list of ‘Cantreds, Commotes and Parishes of Wales’ drawn up c. 1566, and printed in a Report on manuscripts in the Welsh language (Evans 1898  1910, Vol 1 Pt 2, 911-20). The printed version also contains comparisons with a different list drawn up c. 1590-1 by John Brooke of Mawddwy. A third list (Cardiff Ms 15) is mentioned, but considered to be a transcription of the Peniarth Ms. The version printed by Evans was used for this report. In the 18th century Browne Willis compiled descriptions and surveys of the Cathedrals in Wales, and in his Survey of the Cathedral Church of Bangor (Willis 1721), he includes a list of churches and dependant chapels within the Diocese. This list was used by Wade-Evans to produce his Bangor entries in Parochiale Wallicanum (Wade-Evans 1911), a source usually taken to be the starting point for any study of church or chapel identification. However Wade-Evans supplemented his list with entries from Rees’s Essay on the Welsh Saints. Rees’s list, published in 1836, is given in his Appendix III and contains a number of sites not previously mentioned, though unfortunately Rees provides no evidence of his source material. For Anglesey this list is supplemented by one compiled by Hugh Hughes (1693-1776), an antiquarian who lived at Llwydiarth Esgob on Anglesey (the list was transcribed and printed in the Cambrian Register for 1796 (Thomas 1796), the original manuscript has not been located). These lists were further used by E Neil Baynes to produce a list of Old Monasteries, Abbeys, and Chapels of Anglesey supplemented by information from other sources (Baynes 1920  the list of sources used is given on p. 33). The problem of defining a church from a dependant chapel was overcome by using the 19th century definition of parishes at the time of the Tithe Apportionment survey in order to define a parish church. Thus, a church that is primarily associated with a specific parish (even if that parish became extinct after the Middle Ages), is termed a parish church. The following categories were used during the course of the project to aid understanding of the various structures found. 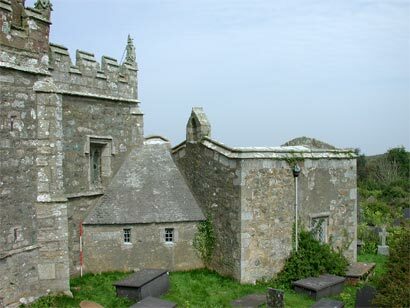 Chapels associated with monasteries, usually found on outlying granges or manors. The status and importance of many of the sites within the study could not be determined without further work. The location of many sites could not be identified with certainty, and they would benefit from an enhanced documentary search, using primary and secondary archive sources, aerial photographs and place name evidence. Sites that are located with certainty often remain difficult to assess from a field visit alone, and full assessment would only be achieved by a programme of field evaluation, using geophysical survey and, if relevant, trial excavation. Recommendations are made within the report for enhanced desktop assessment and field evaluation.